Maria O’Brien’s new body of work, created during her residency in The Laois Arthouse from August 2014 to present, reveals a renewed exploration into landscape for the artist. By working directly from photographs, found mostly on social media, the artist offers us glimpses into other people’s worlds. The artist produces small scale paintings in oil on primed paper which allows her to work quickly without being too rigid and is reflective of her vast and ever increasing body of research. By painting these glimpses into other peoples’ lives, a new form of existence is being offered to them. Today there is visual over-saturation. Social media bombards us with the mundane and the fantastic (one often melding into the other). By painting images that would otherwise be scrolled through quickly or swiped past in an instant, O’Brien gives new life to the captured seconds and the people and actions they contain. One has to give pause to consider O’Brien’s studies of these everyday instances and the gravity given to them by her time and attention. Seeing these moments in paint we are forced to slow down and observe. The artist seeks to capture them and by doing so elongates a moment in time. ‘On My Green Way I Wend’ explores humans engaging recreationally with the outdoors – using nature for their own diversion and entertainment with all the paraphernalia this involves. What the viewer is privy to is human and nature, not quite as one but relating to each other. O’Brien’s fluid style further emphasises this, both figure and landscape are often given the same treatment, the same brushstroke. The texture of the human does not differ from that of the surrounding terrain that they inhabit, even though they are often at odds. This serves to highlight our attempt to control the natural world, the sports equipment and its deceptively simple representation offer humorous insight into this struggle. 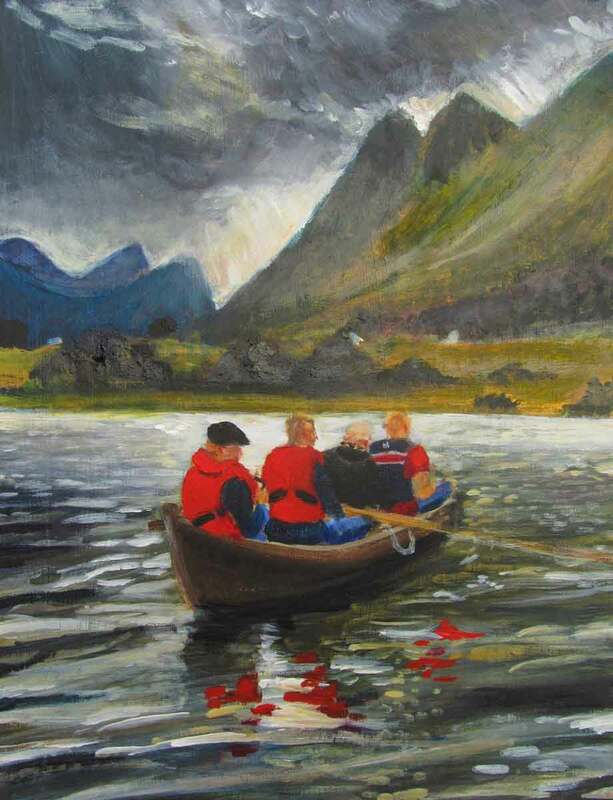 The Tipperary born artist is fascinated with landscape, but does not revere it. Her countryside is useful; it is accessible and it is for everyone. It is not a remote or abstract place; it is real. Action shots are painted quickly and deftly capturing the energy and spontaneity of the interaction between humans and their surrounds. She is working impromptu, from a moment captured by a stranger. Palette and a brushstroke are directly influenced by the light and action of her chosen setting. In paintings such as ‘Canoeist Pausing’, ‘Tiny Skier’ and ‘Pepper Canisters’ one can sense a yearning for the sublime, but not quite the sublime of Friedrich’s ‘Wanderer Above the Sea of Fog’. O’Brien’s use of humour; the poses of the people, the handling of paint to somewhat distort the humans, the use of social media images to feed her work all reflect more of a kitsch look at the sublime, a less reverent take on what the representation of an ideal is and should look like. In the ‘Tiny Skier’, the figure is poised under a stormy, threatening sky and looks as though they are about to be subsumed by the enormity of the surrounding landscape. The figure in ‘Tiny Skier’ was created with only a few hairs of a brush, yet the self-conscious pose and the excitement in waiting for the photo to be taken is all translated to the viewer. The proximity between the sublime and the absurd is successfully alluded to. O’Brien uses paint astutely to evoke light, her quick, broad brushstrokes allow little space for detail but lends itself strikingly to create atmosphere. In ‘Snowmobiles at Night’, she conveys the winter scene though her deliberate application of tones, using a limited palette of white, violet, indigo and paynes grey. In ‘Parasols in Sugar Beach’, a sultry scene is captured faithfully. The painting faces us as though through a filter, a nod to the medium from which this image was sourced and the many possibilities of contemporary, personal photography. This brings to mind again the pretense and showmanship involved in using social media, the manipulation and construction involved and how these constructs are quantified, dismantled and understood by the viewer. As it turns out, Sugar Beach itself is a construct, it is an entirely man-made urban beach park in Toronto, swimming and water sports are not allowed here, the beach is not functional and was made purely for aesthetic purposes. We see how O’Brien’s use of titles situate the artist at a distance from the people who populate her paintings. That is not to say that she does not empathise with them, it is clear that she does from the very fact that they have made it into her body of work. It is more that titles do not let us forget that we are looking upon people who have been gleaned from the web pages of social media. Throughout ‘On My Green Way I Wend’ O’Brien is drawing attention to how bizarre the human struggle to engage with nature often seems. She highlights this through her palette, the often ostentatious coloured garb jumps out against the natural background. She is painting people who want to be seen; a basic human desire. As much as wanting to be seen is innate in human nature, so is wanting to watch others, in the artist’s case painting the memories of perfect strangers. It is through her observation of the human in their surrounds, through her choice of content and rich surface, that the artist has created a new platform from which we, the audience, can vicariously people-watch ourselves. Siobhán Mooney is a curator and writer based in Dublin.